NEWARK, New Jersey (WABC) -- Police are trying to identify the remains of a woman recovered from the Passaic River in Newark. In 2013, the body of a black woman with curly black hair was recovered. She was 30-50 years old when she died, 5 feet 4 inches and 140 pounds. 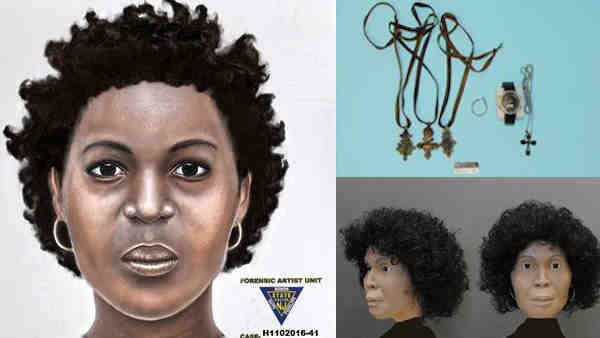 The New Jersey State Police created a clay rendition of her face and a sketch based on the skull. The woman was found wearing thermal clothing and distinctive Ethiopian jewelry. She was wearing a chain link with a black cross pendant, as well as three necklaces with multicolored ribbons of red, yellow and green. The ribbons held three charms reminiscent of Ethiopian crosses. Each had a different design. She also wore metal hoop earrings. Anyone with information on the case is asked to call (973) 621-4111 or (609) 882-2000.